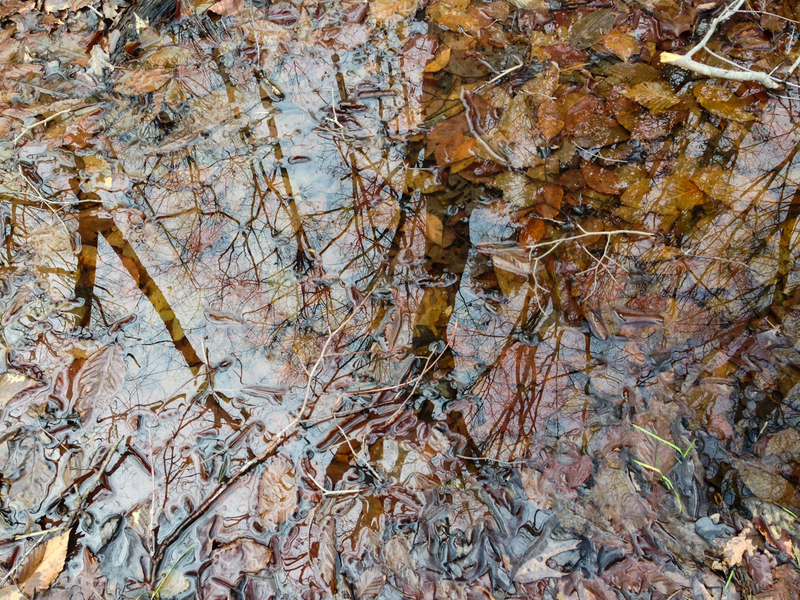 Spring comes earliest to the bottoms of stagnant pools – there no cool winds blow – no hoar frosts penetrate – but they grow protected as under a glass. There are fewer disturbing influences to rob them of the full advantage of the sun’s increased altitude. Conservation groups, in partnership with Partners in Amphibian and Reptile Conservation, are designating 2014 as the Year of the Salamander (http://www.parcplace.org/news-a-events/2014-year-of-the-salamander.html). So, naturally, one of my naturalist friends has decided this is the year to see as many of North Carolina’s salamanders as possible. With that in mind, a few of us went to Pilot Mountain State Park this weekend in search of whatever amphibians we could find. While many visitors simply drive to the summit and gaze out across the valley, or enjoy the view of Big Pinnacle, we were looking for things in the low country, in the Yadkin River section of the park. I had been to this section only once, years ago, when working for the state park system as a naturalist, so it was a great chance to do some exploring. 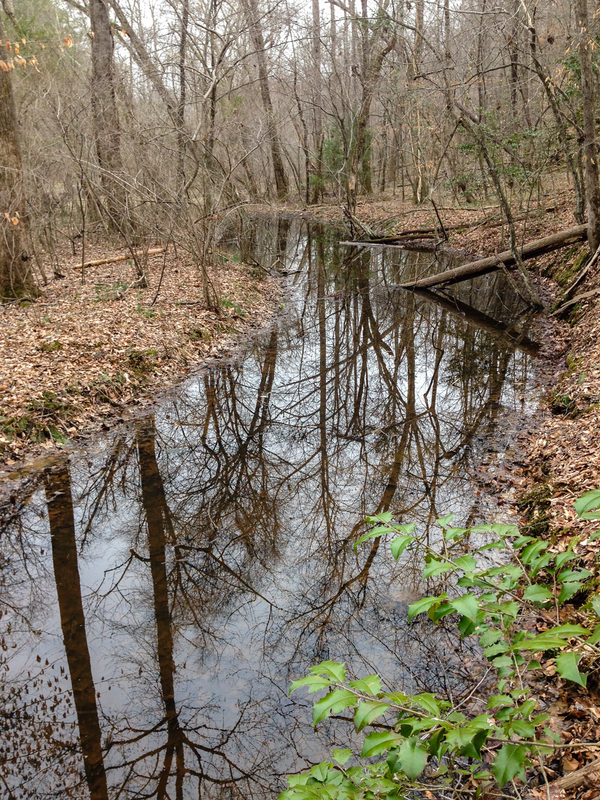 Walking along Horne Creek we came upon an oxbow that is now an isolated woodland pool, perfect for amphibians. An Upland Chorus Frog slowly called but soon fell silent as we approached…a good sign. 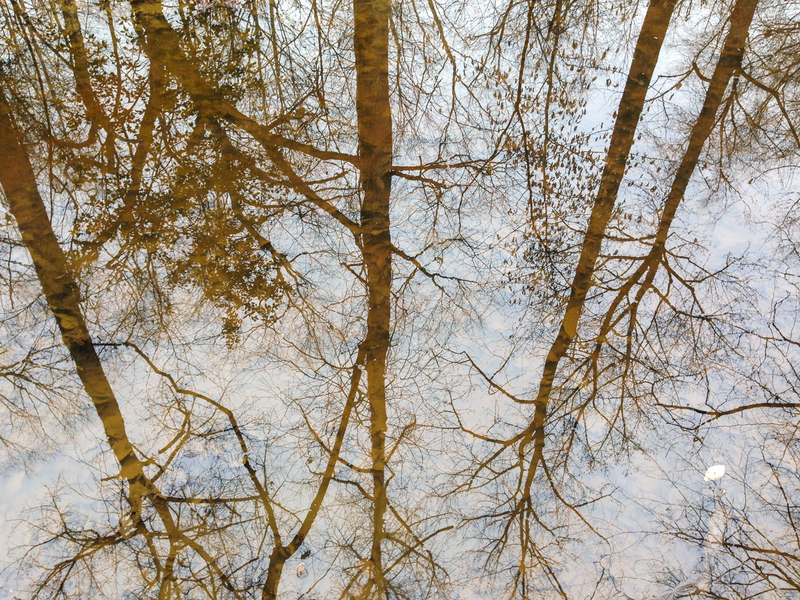 These woodland pools, especially those devoid of fish, are incredible habitats for a wide variety of organisms from macro-invertebrates to frogs and salamanders, They are also beautiful woodland mirrors that reveal a multidimensional world as I stare into the surface, at first seeing only the trees above, and then the dark bottom, covered in leaves. As I walked along the pool edge, I could see a few Water Striders, but little else, until I got to an area where a cluster of sticks protruded from the pool’s surface – amphibian egg masses! At first glance I thought they were Spotted Salamander egg masses, but my friend, Megan, pointed out they were Wood Frog eggs. 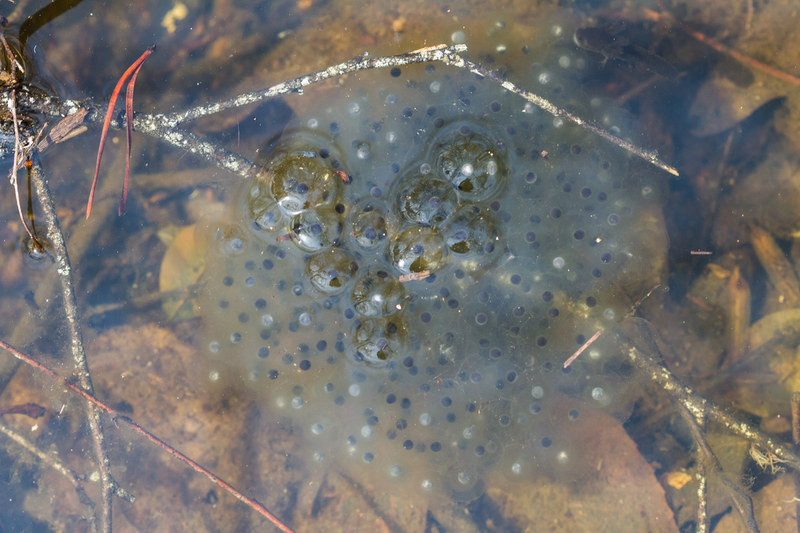 Compared to the egg masses of Spotted Salamanders, the Wood Frog egg masses tend to be more globular, somewhat larger, and lack the stiff outer gelatinous matrix of the salamander eggs. There were several blobs of eggs attached to the twigs, with some appearing recently laid, and others more developed. As they age, the eggs are colonized by a symbiotic algae, Oophila amblystomatis, which imparts a greenish color to the cluster. This same algae colonizes Spotted Salamander eggs and is believed to utilize some of the waste from the developing eggs while providing some oxygen for them. 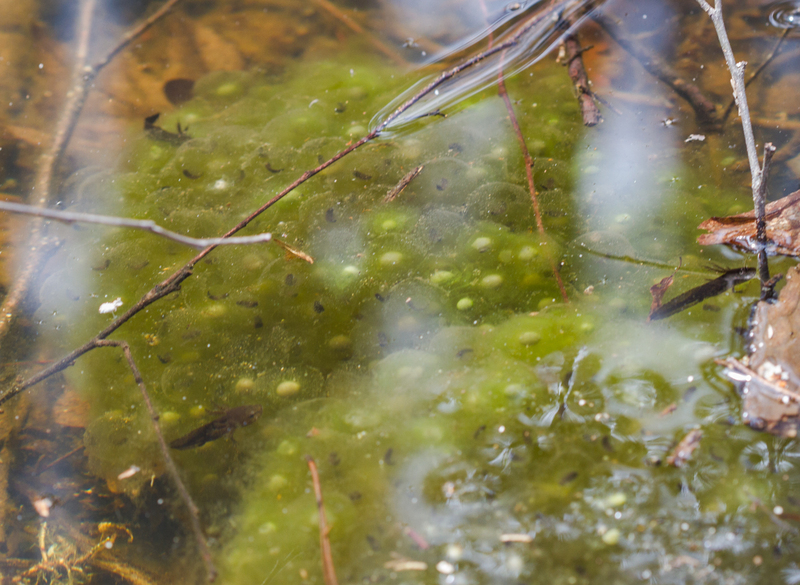 The Wood Frog egg masses also tend to flatten out at the surface of the pool as they age. While staring at one I noticed some movement – there were Marbled Salamander larvae resting on them. Marbled Salamanders lay their eggs in the fall as these pools fill with rainwater, and their larvae are well-developed predators by the time many of the other amphibian species start to hatch. Looking down I saw one of these tiny pool tigers swim up to an egg mass and position itself, just in case there was an early hatching by a tasty Wood Frog tadpole. The more mature green egg masses had many more Marbled Salamander larvae in attendance (look for the dark elongate shapes in the photo above). Since the Wood Frog tadpoles tend to cling to their egg mass for a few days after hatching (to feed on the algae), it is a perfect place for the Marbled larvae to hang out. The hatching frog tadpoles are weak swimmers and easy prey. I gently scooped up one recent hatchling for a quick photo. 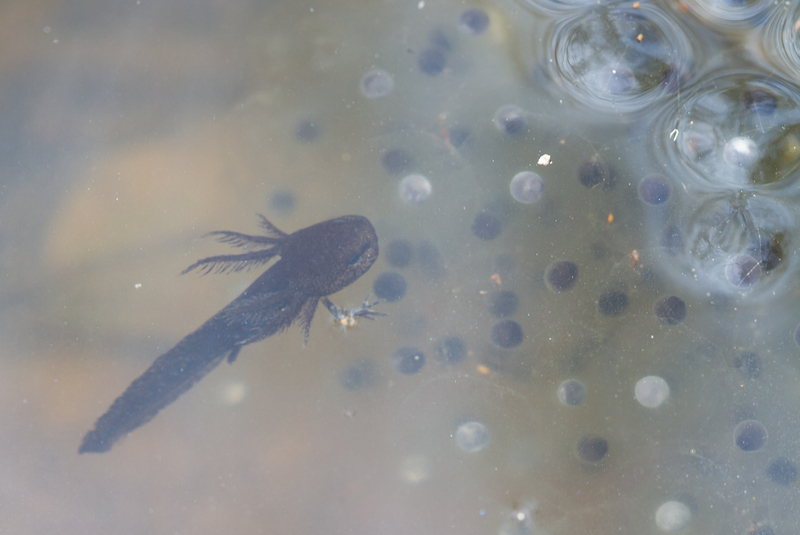 Luckily for the frogs, each egg mass contains a few hundred eggs, which should be enough to ensure survival of at least some of the tadpoles. I love spending time near these pools, waiting, watching, listening – there is so much life to be found. Yet these are often some of the first habitats destroyed when we alter the landscape. I have witnessed once thriving amphibians pools destroyed by nearby earth moving which forever alters the drainage pattern or by intentional draining due to concerns about mosquitoes. In fact, the thriving community of predators in a typical woodland ephemeral pool usually means few or no mosquito larvae can survive. And without the woodland mirrors, both our forests and our natural heritage are diminished. I learn that one farmer, seeing me standing a long time still in the midst of a pool (I was watching for frogs), said that it was his father, who had been drinking some of Pat Haggerty’s rum, and had lost his way home. So, setting out to lead him home, he discovered that it was I. 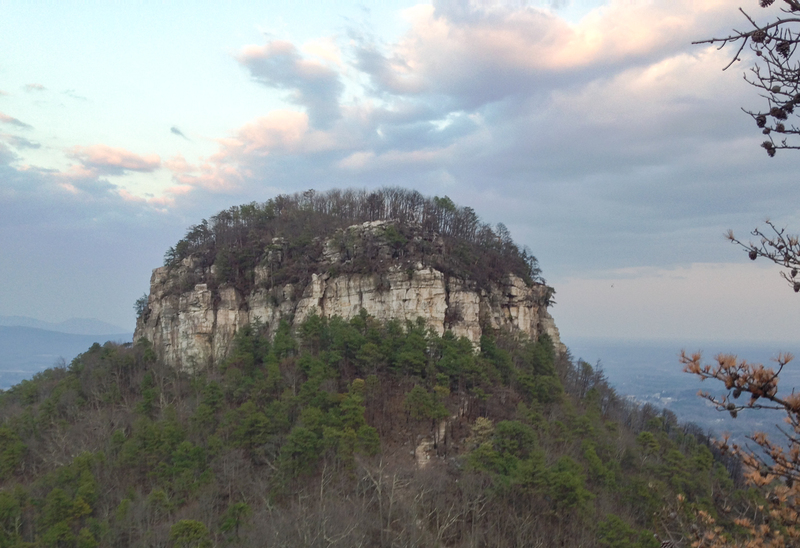 This entry was posted in Natural History, Trip report and tagged amphibian eggs, marbled salamander larvae, pilot mountain state park, wood frog, woodland pool by roadsendnaturalist. Bookmark the permalink.